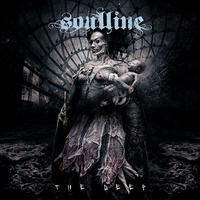 SOULLINE is a Swiss band of Melodic Death Metal. Debuting in 2001, they quickly became a live band, with more than 200 concerts (Wacken Open Air 2008 and various concerts), opening for SEPULTURA (2012), PRO-PAIN (2013), ELUVEITIE, SIX FEET UNDER, and MOONSPELL (2016-2017). They released their first record, "Oblivium," in 2007. "The Struggle, the Self and Inanity," their second album, was presented during the 2010 tour in Russia. “We Curse, we Trust”, their third album, was out on Summer 2012. They completed The Final Revolution Tour in December 2013 supporting PRO-PAIN and playing in Germany, Poland, Hungary, Czech Republic, Belgium and The Netherlands. Their 4th album “Welcome My Sun” has been produced by Dan Swanö, at Unisound Studios in Örebro Sweden, and released in April 2015. So, what about this new record, called "Deep"? With fast-tempo playing guitars, a powerful voice and a hammering drum, "Deep" shows that SOULLINE is the kind of band that makes records to share them with the audience on stage during tours (a little bit like IRON MAIDEN) because it is part of their DNA. The whole album is like a dark strong coffee cure, not too strong, but tasty, and not too much sugar, not too sour. The voice of Ghebro is powerful (like in "Leviathan" or "Filthy Reality"), the guitars lead us to a highway of pure sound ("Into Life", "The Game"). The bass and the drums give a powerful rhythm to the songs ("The Darkest Me", "Still Mind"). So, this album leads one path, that every track follows, making it one entity with several parts, different but with the same mood. This sounds great! "Leviathan" and "Cool Breeze" open the album with powerful singing and fast but not too furious guitars to show us the path we are going to. It is efficient, and would make a nice live set. We reach the cruising speed with "Nightmare" and "The Fall" with beautiful melodies, because we are voyagers on a splendid trip. As the refrain from "Nightmare" is powerful, "The Fall"’s is more aetheric, like a ray of light through the clouds. "Filthy Reality," "Into Life," "The Game," and "Deepest Me" make another part of the album, more smooth, with an aetheric voice on "Filthy Reality", a cooler tune with "Into Life" that ends with a violin play, linking to a melodious opening on "The Game", that is like an hymn. A future live hit would be "Deepest Me" with the chanting guitars and this powerful voice. "The Deep End" is a nice interlude played with a chime. Nice but too short. Will they perhaps play it longer during their shows? "Still mind" takes us back to the core of SOULLINE’s music, with a powerful intro, a catchy melody, and a spoken end.